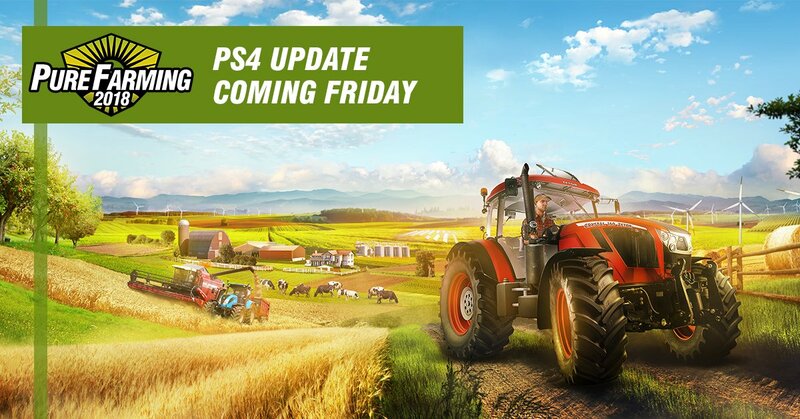 Pure Farming update 1.1.2 is now available on PC. Again, we have focused heavily on fixes and improvements request by players. Here is the full list of bug fixes and feature changes. Changes directly requested by players are underlined. Looks great. Any news E.T.A. for the console patch? LocationIn a jar... On a shelf. Hi! The console patch is in the works and should be released very soon, indeed. It's going to include the changes from both PC patches. Great! Can't wait. It was a long wait, but hopefully it will be worth it. Having a lot of fun with the game. I was thinking that, too, but I didn't want to get my hopes up. By the way, updates can be released outside store updates, if I'm not mistaken. I could swear I saw them more often for other games. We can confirm that the next update for PS4 will be available on Friday. As a thanks for everyone's feedback and support, we'll be adding two new machines along with that update. Due to differences with submission processes, the Xbox One update will come a few days later. Now if we could just get a confirmation on those orange orchards for console players, that would be great. Indeed, I feel for you! Who said that Xbox plebs and PS4 plebs can't agree with each other. One big happy farming family.